Look forward to waking up every day by creating your very own cozy breakfast nook. These offer a perfect space to relax as you enjoy your first meal, and the great thing is, you don't need that much space to install one. Here are some beautiful examples of nooks which you can take ideas from to create your own. Just because you don't live in a cottage, doesn't mean you can't recreate their very sought after cozy atmosphere. Satisfy your cravings for a homely, relaxed breakfast nook by taking inspiration from cottage interiors. Rustic furniture is the epitome of comfort and often found in a cottage home. So add a wooden table and long bench to create the restful ambience you've always dreamed of. Decorate the top with coordinating flowers as plants have been shown to enhance your mood and relieve stress, as well look pretty as a welcoming focal point. For the walls and ceiling, avoid using dark colors which will encourage your grouchy mood and brighten them up with white paint. If you're worried that the white might look too sterile, choose a soft shade which looks clean but not too sharp just like this breakfast nook. When it's dull outside and there's not much light coming through the window, you will need more than just white paint to add brightness to your space. Hang a large pendant above the table as this will offer additional brightness during those gloomy days, and keep your spirits uplifted. To finish off the look, place a selection of brightly colored cushions across the seating area to add some fun pops of color to the room. If you have a large family, it can often be a struggle to sit them down at the same time. To ensure your family can enjoy their meals together away from the TV, install a large pedestal table, as this should be big enough for up to six people to sit round. A built in leather banquette around the table adds laid-back charm to this casual dining area, while the storage underneath helps to prevent a cluttered mess. Add warmth to the nook with the use of a rich shade of golden brown for the seating and accessorize it with cozy cushions that feature flowers of the same color to maintain coordination. Prevent headaches on the morning by steering clear from busy patterns on the walls. A white color scheme offers a clean, crisp and simplistic look which should help keep your head clear and focused. In this Scandinavian home, the breakfast nook features a beautiful blue palette inspired by the sea. Delicate light shades of blue create a serene, calm atmosphere and beautifully complements the white tones of the walls and dinnerware. 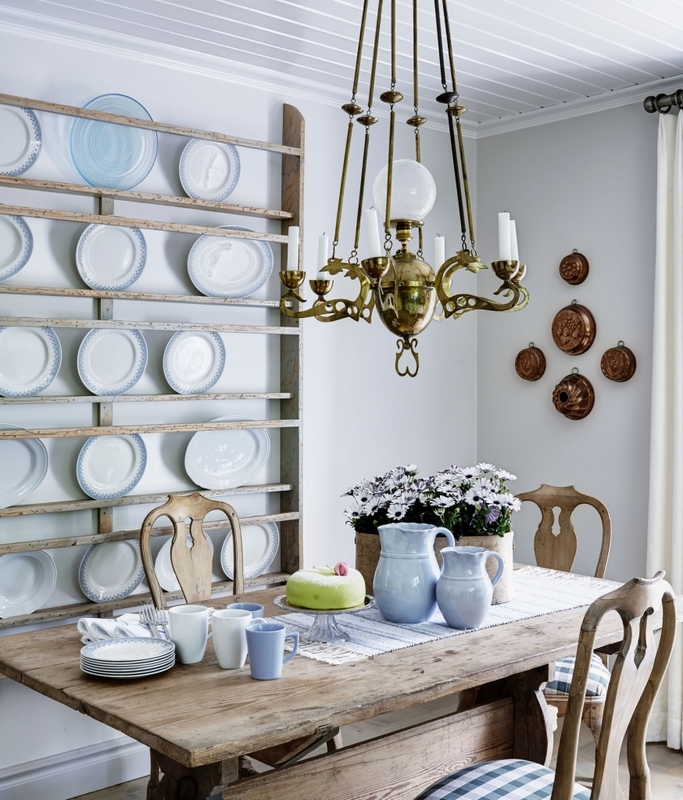 A traditional plate rack not only provides a handy storage space for your plates but adds a quirky decorative element to your breakfast nook. These racks are easy to set up, and are a great way to showcase any dinnerware that features interesting patterns or styles. Other traditional aspects you should consider incorporating include the gorgeous hanging chandelier which brings a stylish vintage look to the room. Below the light are vintage chairs and a table which add to the rustic charm already emanating from the wooden plate rack. The combination of blue and white cushioning on the seats coordinates with the overall color scheme and provides the final touch which helps pull the room together. Summery shades of yellow are a brilliant color choice which are sure to put a smile on your face when you get breakfast. The yellow blind hung above the window accentuates the natural light shining through into the nook. Underneath the window a cozy seating area with complimentary yellow pillows offers a comfortable retreat after eating where you can relax and read a book. Wicker chairs and a rustic farm table add soft warm tones which accent the yellow elements surrounding them. To boost the positive impact on your mood, the final touch of green flowers on the table adds freshness and beauty to this very cheery room. This cozy little breakfast nook proves that size doesn't matter. If you are limited on space but want an area where you can peacefully enjoy your breakfast, it's still possible to create a nook. Find a window in your home that lets in a lot of natural light and set up your breakfast nook nearby. The light shining through on the morning will help you to wake up and feel energized, so you're prepared for whatever the day brings. A cushioned bench offers you the option of seating two people as well as resting there on your own with your feet up. You only need a small table for a nook of this size, so make sure it is big enough to fit your breakfast, but not too big that you feel crammed in when sat down by the window. The addition of a small vase of flowers provides a welcoming homely touch to the nook and creates a pretty focal point which enhances the style of this space. This is another great example of a small and beautiful nook. If you have an unoccupied corner with enough space to seat two people, you can easily turn it into a relaxing area for breakfast. Source a round table which matches the color of your walls so it seamlessly blends in with the decor. The chairs chosen to go with the table were originally bought from a flea market, proving it doesn't matter too much where you get your chairs from. Just make sure you have two that match. To help you wake up in the morning with a smile on your face, a warm tone of marigold has been painted on the backs of the chairs which resembles a shade similar to the sun. In addition to this, a pretty green potted plant is placed on the table to enhance your mood and bring freshness to the room. 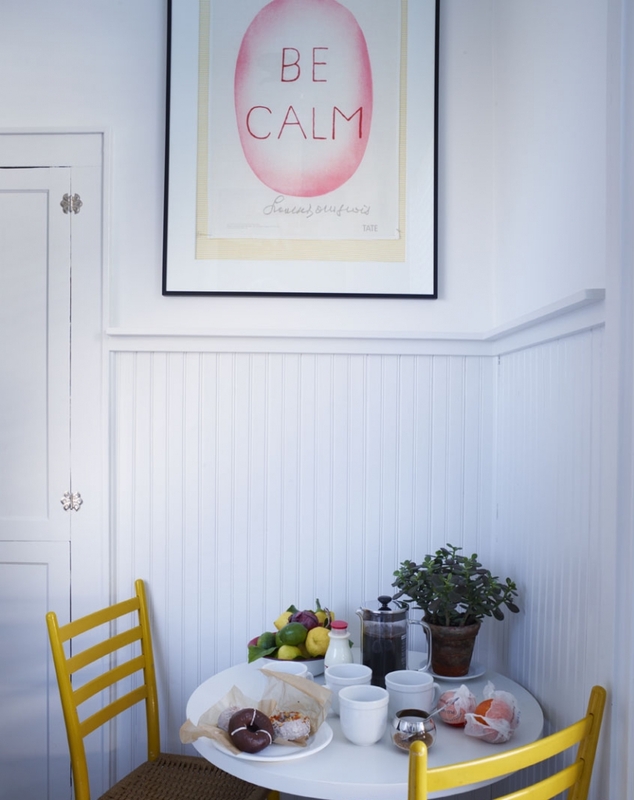 For the finishing touch, a framed tea towel with an encouraging message is hanging above the nook to boost positivity and add color to the breakfast nook.